Motor Vehicles Act, 1988, S.166–Accident–Negligence–Once, it is held that there was no negligence on the part of driver of the offending vehicle, no relief can be granted to the claimants, even if it is held that the death was on account of the injuries sustained in the accident. Comments Off on Motor Vehicles Act, 1988, S.166–Accident–Negligence–Once, it is held that there was no negligence on the part of driver of the offending vehicle, no relief can be granted to the claimants, even if it is held that the death was on account of the injuries sustained in the accident. Accident—Negligence—Though the mere registration of an FIR may not be the sole basis for returning a finding of negligence but it can be considered as material fact to form a prima facie view. Comments Off on Accident—Negligence—Though the mere registration of an FIR may not be the sole basis for returning a finding of negligence but it can be considered as material fact to form a prima facie view. Driver of vehicle in which passenger was traveling had not exercised caution of giving strict instructions to passengers to keep their arms inside so that no untoward incident takes place-Only driver of vehicle held to be liable to its owner- -Held; it was a case of composite negligence and claim could not have been dismissed-Appeal allowed. Comments Off on Driver of vehicle in which passenger was traveling had not exercised caution of giving strict instructions to passengers to keep their arms inside so that no untoward incident takes place-Only driver of vehicle held to be liable to its owner- -Held; it was a case of composite negligence and claim could not have been dismissed-Appeal allowed. Accident—Tort Feasors— Where a tort feasor himself was claimant then his share as tort feasors has to be deducted from total compensation payable; otherwise it would amount to undue enrichment for him. Comments Off on Accident—Tort Feasors— Where a tort feasor himself was claimant then his share as tort feasors has to be deducted from total compensation payable; otherwise it would amount to undue enrichment for him. Accident—Negligence—Motorcycle on which the deceased was riding had four persons sitting on it—This in itself cannot give rise to an inflexible presumption that it must be a contributory cause for every accident. Comments Off on Accident—Negligence—Motorcycle on which the deceased was riding had four persons sitting on it—This in itself cannot give rise to an inflexible presumption that it must be a contributory cause for every accident. Accident—Negligence always does not mean absolute carelessness but want of such a degree of care as is required in particular circumstances. Comments Off on Accident—Negligence always does not mean absolute carelessness but want of such a degree of care as is required in particular circumstances. Motor Vehicles Act, 1988, S.166–Accident–Negligence–Sitting capacity of vehicle- -The deceased was driving with three children on the pillion who were in the age group of 12—The motorcycle is designed to ride two persons but that by itself would not be a ground to hold the driver guilty of contributory negligence. Comments Off on Motor Vehicles Act, 1988, S.166–Accident–Negligence–Sitting capacity of vehicle- -The deceased was driving with three children on the pillion who were in the age group of 12—The motorcycle is designed to ride two persons but that by itself would not be a ground to hold the driver guilty of contributory negligence. Accident—Negligence—Merely because deceased was not wearing a helmet; contributory negligence cannot be presumed. Comments Off on Accident—Negligence—Merely because deceased was not wearing a helmet; contributory negligence cannot be presumed. 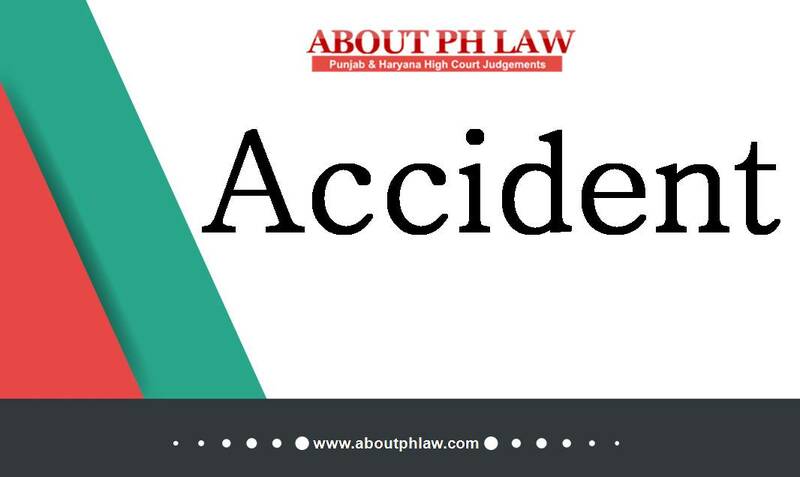 Accident—Negligence—Deceased had entered the road from the field/link road—Case held to be of contributory negligence with major liability testing resting on deceased—Liability apportioned at 70:30. Comments Off on Accident—Negligence—Deceased had entered the road from the field/link road—Case held to be of contributory negligence with major liability testing resting on deceased—Liability apportioned at 70:30. Accident—Negligence—Moving vehicle dashed from behind into standing vehicle—Sole negligence would be on standing vehicle. Comments Off on Accident—Negligence—Moving vehicle dashed from behind into standing vehicle—Sole negligence would be on standing vehicle. Accident—Negligence—Vehicle standing in middle of road—Vehicle dashed from behind—Sole negligence is of stationary vehicle. Comments Off on Accident—Negligence—Vehicle standing in middle of road—Vehicle dashed from behind—Sole negligence is of stationary vehicle.